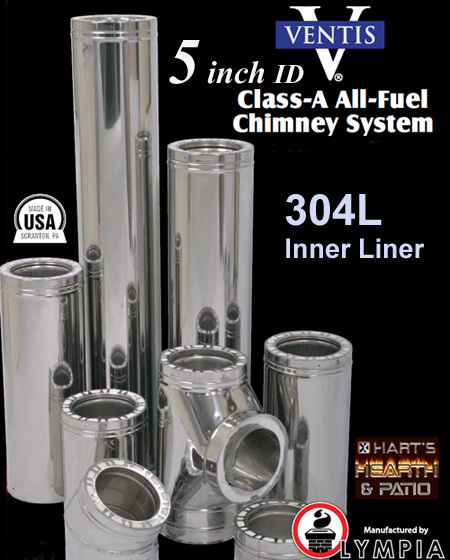 NEW to ANY Class A Chimney System! : COLORS!!! That's right! 7 PowerCoat paint colors to choose from! No more need to have the shiney stainless steel look. You can now come close to or match the color of your house, roof or whatever. To see the color chart, Click Here Metal Chimney in color; ONLY from the inovators at Olympia Chimney and found here at Harts Hearth & Homestead!!! 30 Degree Wall Pass Through; 5"
5" Round Cath Ceiling Supt 11"
5" Round Cath Ceiling Supt 24"
5" Cath. Ceiling Support 11"
5" Cath. Ceiling Support 24"
Elbow, Support 5" to 8"
Telescoping 304 SS Roof Brace 5" - 8"
Telescoping Roof Brace 5" - 8"